Save money by recycling waste material cuttings produced from your metal milling machines. The JBF 100-54 metal chip Shredders offer outstanding and reliable cutting technology , and can be either stationed adjacent to each milling machine or used as a centralized solution, as an essential part of a production management strategy of each production tool. The JBF 100-54 shredder can be adapted according to the specific waste material and the throughput generated. With each solution we are able to provide a sturdy design, long tool life and low maintenance requirement, which will lead to a quick recouping of the initial machine outlay and continued profitability over a long period of time. The slow-rotating cutting shafts are integrated into a large machine frame which results in a low-wear and low-noise operation, and depending on cutting material and final chip size required a long term solution can be individually designed to suit all requirements. To provide an accurate classing of the cutting material the JBF 100-54 chip shredders can be fitted with a granulating screen underneath the cutting unit which in turn has a screenhole size which can be adapted individually. 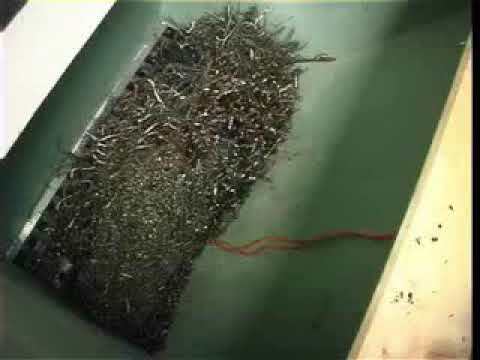 The chips produced will continue to be shredded until they pass through the screen sieve, and are eventually deposited into a suitable container under the unit. All oversized chips are taken back into the cutting zone until they are shredded into a suitable final chip size. Inside the feeding funnel a mechanical, electromotive or hydraulic driven pushing device can be installed as an option to enable a faster continuous operation even when processing the most problematic cutting materials.